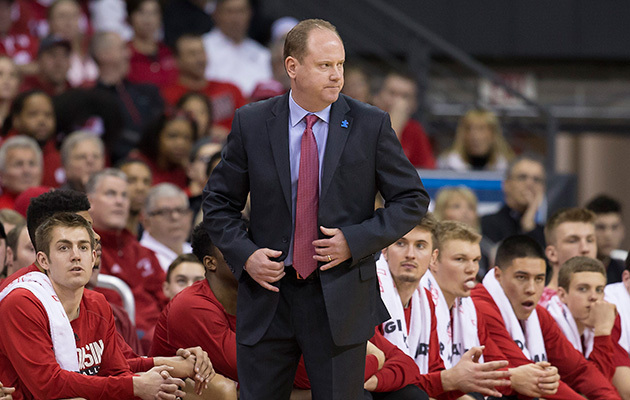 Wisconsin has hired interim coach Greg Gard to take the position full-time, officially replacing Bo Ryan. Wisconsin’s remarkable basketball revival was in full swing after a late February practice, the Badgers preparing for a matchup at then No. 8 Iowa that would become their ninth victory in 10 games. It was likely the result that clinched interim coach Greg Gard’s eventual ascension to the full-time post. But it was still two nights away as junior guard Zak Showalter stood on the Kohl Center floor, discussing how Gard rebuilt the Badgers on the fly, how he refocused them on good habits, how he brought a somewhat splintered group together after Bo Ryan’s sudden Dec. 15 retirement. With one remark, the Showalter crystallized how adjusting to a new approach was essentially no adjustment at all. He will continue to do so, as Wisconsin named Gard its permanent head coach late Monday. The many ways in which the 45-year-old earned this opportunity are so plainly obvious and well-documented that they’re almost not worth rehashing; just start with 15 years of apprenticeship on the sideline in Madison, and end with the Badgers starting 9–9 overall but nevertheless rallying to their 16th straight top-four finish in the Big Ten and toward another NCAA tournament appearance. And as soon as Wisconsin’s Board of Regents approved Gard’s five-year contract, the relevant data was not what Gard had done but what he will do, anyway. In this, Showalter’s minor point strikes a major chord: The advantage of hiring Greg Gard as a first-time head coach is that he does not come with virtually any of the standard drawbacks of a first-time head coach. He understands the program and the school. He intimately knows the recruiting landscape and what kind of players his staff must unearth to maintain a contending roster—a critical point of clarity if, as you’d expect, Wisconsin remains the sort of program that must develop talent over time. You need an eye for the Frank Kaminskys and Ethan Happs, and Gard should have one; as Showalter indicated, the new Badgers coach pretty much recruited everyone on the current roster. Surely, had Alvarez opened a national search and somehow lured a Tony Bennett (from Virginia) or a Chris Mack (from Xavier) to campus, the program would be well positioned to succeed. (The likelihood of that scenario is moot.) That’s the prospect Gard effectively competed against since mid-December. Given the results, and given his familiarity with all the idiosyncrasies of the place, it’s now very arguable that Wisconsin sacrifices nothing in moving ahead with Gard in charge. And if you’re looking to arrange it so your first-time coach rides into the future with nary a bump on the road, the circumstances are ideal. There’s no sense in trying to predict a stay-or-go-pro decision from Nigel Hayes, because that would require attempting to think like the junior forward thinks, and it’s possible no human in history has thought like Hayes thinks. But should the Badgers’ 6'7" leading scorer return to Madison, he’ll rejoin senior-to-be Bronson Koenig (13.5 points per game) and Happ, who averaged 11.9 points and 7.8 rebounds en route to Big Ten freshman of the year honors. That is a core equipped for a run at a league title. So Gard not only takes the Wisconsin job without any learning curve about the basic mechanics of it, but he also might have the talent on hand to establish high-level credibility early in his tenure. (With no high school prospect signed and/or committed for the Class of 2016 and just one, in-state guard Kobe King, committed for the Class of 2017 and beyond, this could be essential.) The timing of his takeover as interim coach wasn’t the best. Depending on Hayes’s decision, the timing of his rise to the full-time gig might be perfect. And now the usual caveats: Nothing is guaranteed, and we’ll see how much Bo Ryan’s presence and bombast stoked the Badgers all these years. But here, Gard’s timing might not be bad, either. The recent disclosure of Ryan’s​ extramarital affair, and the school’s subsequent investigation as to whether he misused university funds during it, is tawdriness any place can do without. (The school cleared Ryan of any wrongdoing, and the TMZ cameras aren’t descending on Madison any time soon, but that sting will linger a bit.) It’s perilous to make personality judgments on those we simply don’t know well. But based on the testimony from anyone orbiting Wisconsin’s program, Gard is as stable and unaffected as can be expected. During a late February conversation about the program’s in-season turnaround, a lack of pretense was evident, not least when Gard choked up discussing his father Glen’s battle with terminal brain cancer last year. (Glen Gard died Oct. 30; Greg carries his funeral card in his suit pocket every game.) Earnestness and steadfastness, at the moment, would serve Gard and Wisconsin well and probably even earn the new coach some extra credit in light of the revelations about his mentor and predecessor. While it was at first prudent to see how this all would go after Dec. 15, it seems ludicrous to suggest Wisconsin could have made a better decision in March. As of Monday, longtime lieutenant Greg Gard shed his interim tag for the full-time job he always wanted. He is a head coach without qualification, and more than qualified for the important work that comes next.